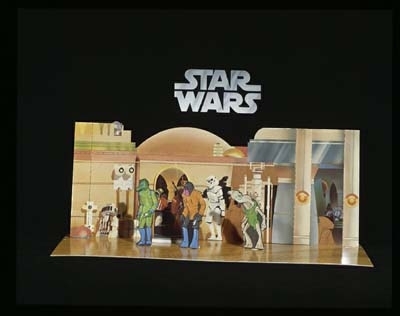 This is a cardboard mock up of the Cantina Adventure Set sold by Sears in the United States. The playset is lacking the Blue Snaggletooth figure but has cardboard cut outs for the other Cantina creatures which came bundled with the playset. This Kenner file photography is courtesy of Cloud City Collectibles.